Money is one of the least-discussed subjects in a marriage, yet it’s also the major reason for fights and divorce. Talking about money with your spouse doesn’t have to be stressful. In fact, you’ll have a better understanding of what matters to the other person in your relationships when it’s discussed. You’ll also receive the benefit of greater financial success in your lives by talking through big financial decisions before they become critical. If you think you are in the right about the way the finances should be handled, the one thing that will put off your spouse is by starting the conversation by saying he or she is wrong or the finances should be done a certain way. Communication is key when it comes to talking about finances with your spouse. You can express how you feel about the finances, but you also need to be able to listen. If you show you genuinely want to hear your spouse’s views about how to manage the family’s resources, you’re more likely to come to a solution you both can live with, and get to that point with less stress. Managing finances together sounds simple, but the topic of money can sometimes bring emotions such as anxiety, guilt, or anger to the surface. It’s important to set aside a specific time and place to talk about finances so you can prepare and know what to expect, and you can avoid tricky conversations when they’re least expected or when you may already be irritated by something else. Many discussions surrounding money can end in heated arguments. By giving both individuals permission to have these discussions with no shame or blame, there is less room for heated discussions. You will be “talking” through your problems and taking responsibility for your actions, rather than blaming or shaming. You may still have disagreements here and there about money, but because you are discussing finances regularly, it is less likely that emotions will take over and things will be blown out of proportion. One survey found that 82 percent of married people occasionally hide purchases from their spouse, while another reported that about 30 percent have been dishonest about their spending habits. Often the biggest arguments come from surprises such as when one spouse makes a big purchase without telling the other. To help out this situation, set a predetermined limit that each person can have and spend the way they want. It could be as little as $50 or as much $500. The point is that you discuss and decide that amount together. Another cause of money fights are differing goals. Take time to sit down and make a list of everything you want that costs money. This includes both your short-term and long-term goals such as a vacation, clothes, eating out, retirement savings, paying off your mortgage, and getting out of debt. Next to each item, write down the cost. You’ll then prioritize these goals from the most important to the least important. Each of you will have to compromise a little in order to come to an agreement. Next, create a budget so you can figure out how much you can afford to put towards these goals. Once you’re both on the same page about the financial goals you want to achieve, begin to keep track of your progress and what you’ve agreed to do. Write things down and revisit them during your regular meetings to assess how you are doing and if you are making progress toward your goals. If you are not making progress, discuss what needs to happen. The list can be a great way to manage your monthly conversations. Don’t be afraid to use it and hold each other accountable. 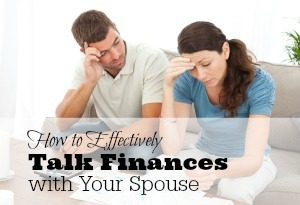 If you have additional tips on how to effectively talk finances with your spouse, please leave a comment.